We are a large circle of over 300 members in the north Glasgow district who combine social activities with fundraising to support the Trust. There is a lively indoor programme of monthly lectures between October and March together with a varied range of outings and walks to places of interest. Every year we organise a holiday to a new area, offering a varied programme of activities. Annually we make donations of around £4,000 to support a number of selected NTS properties. We have initiated a ground-breaking educational project in collaboration with our local authority to stimulate the interest of school children in the activities of the National Trust for Scotland with about £2,000 committed towards the venture. The Bearsden and Milngavie Members’ Centre celebrated the 2017 festive season with an outing to Culzean Castle, Ayrshire for a tour of the house followed by a lovely lunch served in the State Dining Room. 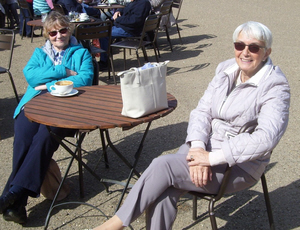 54 Members enjoyed spectacular views across the water to Arran and beyond. We started 2018 with a visit to the City Chambers in Glasgow which was opened in 1888 by Queen Victoria and contains the largest marble staircase in western Europe. Members are kept informed of the details of our events by a bi-annual newsletter. The Bearsden and Milngavie Members’ Centre is open to all members of the National Trust at an individual annual fee of £9 and £13 for a family. New members are always very welcome - please come and meet us either at one of our talks at Milngavie Town Hall or on one of our walks. Programme details are on the "Programme" page. Forty-six of us with driver, Stuart, left Milngavie railway station to travel to Lincoln with a stop for lunch and a visit to the Bowes Museum in Barnard Castle. Our final destination was the Lincoln Hotel, situated opposite Lincoln cathedral, a stunning location. The next day we spent in Lincoln itself, marvelling at the cathedral, the castle, Steep Hill and a canal trip on the Brayford Belle. David, our guide, gave us an amusing tour of the city by coach, followed by an orientation walk. Those who wished had a guided tour of the cathedral, while others sought out the Magna Carta in the castle. The highlight for many was Choral Evensong in the Cathedral. Wednesday was a day of contrasts : Woolsthorpe Manor NT, the birthplace of Sir Isaac Newton, fascinated members, especially in the science discovery centre with its experiments linked to Newton's discoveries. 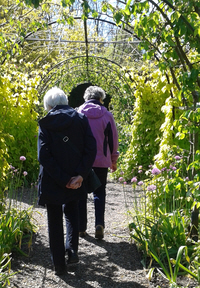 This was followed by a visit to Easton Walled Gardens for lunch, a talk by Lady Cholmeley and a free-flow tour of the garden. No visit to Lincolnshire would be complete without an airfield tour. On Thursday we went to RAF Coningsby to the Battle of Britain Memorial Museum. The guides related stories of astounding bravery in front of the collection of aircraft, including Spitfires. We were treated unexpectedly to an impressive airshow. We travelled from there to Belton Woods Hotel for lunch before continuing to Belton House and Gardens NT for a free-flow visit. On our way home we spent four hours at Middlethorpe Hall Hotel NT near York. 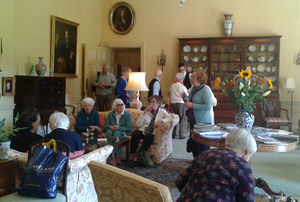 There we admired the beautiful gardens, sipped Pimms in the exquisite drawing room and enjoyed a delicious lunch. A perfect ending to a most delightful week. National Trust for Scotland Bearsden & Milngavie Members' Centre is a registered Scottish charity number SC025422.